The Battle of the Atlantic was the longest continuous military campaign of World War II, (though some say it was a series of naval military campaigns and offensives) running from 1939 through to the defeat of Nazi Germany in 1945, and was at its height from mid-1940 through to the end of 1943. The Battle of the Atlantic pitted U-boats and other warships of the German Navy (Kriegsmarine) against Allied convoys. 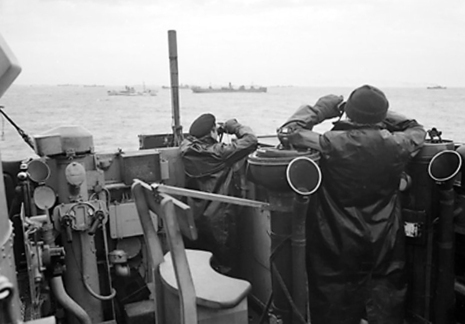 The convoys, coming mainly from North America and the South Atlantic and going to the United Kingdom and the Soviet Union, were protected for the most part by the British and Canadian navies and air forces. These forces were aided by ships and aircraft of the United States from 13 September 1941. The Germans were joined by submarines of the Italian Royal Navy (Regia Marina) after Italy entered the war on June 10, 1940. The name "Battle of the Atlantic", first coined by Winston Churchill in 1941, covers a campaign that began on the first day of the European war and lasted for six years, involved thousands of ships and stretched over hundreds of miles of the vast ocean and seas in a succession of more than 100 convoy battles and perhaps 1,000 single-ship encounters. Tactical advantage switched back and forth over the six years as new weapons, tactics and counter-measures were developed by both sides. The British and their allies gradually gained the upper hand, driving the German surface raiders from the ocean by the end of 1942 and decisively defeating the U-boats in a series of convoy battles between March and May 1943. New German submarines arrived in 1945, but they were too late to affect the course of the war. German U-Boats in the Battle of the Atlantic was the longest battle of the Second World War, beginning from the first day of hostilities and ending on the very last day of the war. It was also the most important battle during the entire Second World War because the success of every other campaign in every other theater of war depended upon its success. Many experts agree that defeat of the German U-Boats and control of the shipping lanes linking the Allied nations of Great Britain, United States and Canada was a key factor if the Allied nations were to invade occupied Europe and the heartland of Germany itself. The Battle of the Atlantic was not about the most powerful navy; neither was it about glorious battles fought between battleships and submarines. But the Battle of the Atlantic was a commerce war waged by German U-Boats against Britain’s merchant marine. For nearly six years, Germany launched over 1,000 U-Boats into combat, in an attempt to isolate and blockade the British Isles, thereby forcing the British out of the war. It was a fight which nearly choked the shipping lanes of Great Britain, cutting off vital supplies of food, fuel and raw materials needed to continue fighting. The Battle of the Atlantic played a very significant part in World War Two. In World War Two, after the escape at Dunkirk and the inspiration of the Battle of Britain, the Battle of the Atlantic was Britain's next nightmare. As an island Britain needed to bring in a vast amount of food and military equipment to survive the war. The German submarine force (U-boats) severely damaged our ability to survive the war - hence Churchill’s quote above when he feared we would be starved out of the war. A great deal of our raw materials came from America and therefore had to cross the Atlantic. In normal times this journey could be hazardous because of the weather but in the war the German submarines lead by Admiral Raeder proved a very real threat. Nazi Germany estimated that they needed to sink 150 merchant ships each month to starve us out. German submarines hunted in what were called wolf-packs. British supply ships crossed in convoys and the ships that brought in our food etc. were slow and they could barely protect themselves. After leaving America they were reasonably safe while in American water and they were also more safe when they approached British waters as we could give the ships fighter plane cover. It was in the mid-Atlantic that we were at our most vulnerable and where to start with the U-boats could run riot.